Priyanka Gandhi Vadra dropped off her husband Robert Vadra as he appeared before the Enforcement Directorate in connection with a money laundering case. Priyanka Gandhi Vadra dropped off Robert Vadra at the Enforcement Directorate office. Congress leader Priyanka Gandhi Vadra, who accompanied her husband Robert Vadra as he appeared for questioning at the Enforcement Directorate offices in Delhi on Wednesday, said she wanted to send a "clear message" with her appearance. "I stand by my husband," she told NDTV. Mr Vadra, the son-in-law of Congress leader Sonia Gandhi, on Wednesday appeared before the investigating agency in connection with a money laundering case. 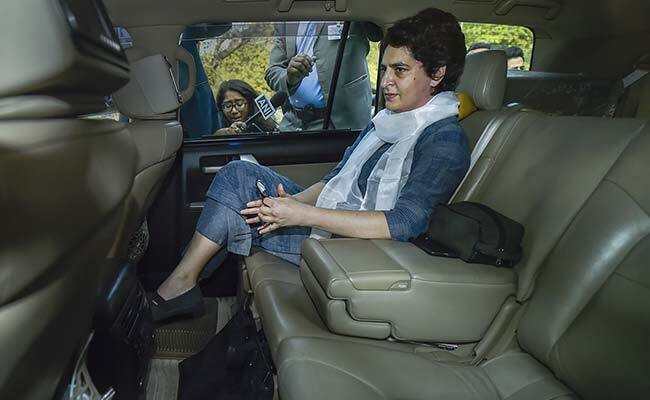 His wife Priyanka Gandhi Vadra accompanied him in a white Toyota Land Cruiser along with security personnel in tow, and dropped him outside the agency's office in Jamnagar House in central Delhi. She soon left in her convoy of vehicles. Mr Vadra entered the Enforcement Directorate office at around 3:47 pm while a team of his lawyers had arrived minutes before him. This is the first time Mr Vadra, also the brother-in-law of Congress president Rahul Gandhi, is appearing before any probe agency. Mr Vadra has denied these allegations in the past and termed them a witch-hunt by the BJP government to settle political scores with the Congress. Priyanka Gandhi Vardra dropped Robert Vadra at the ED offices in Delhi. When Priyanka Gandhi Vadra was recently appointed Congress general secretary in-charge of eastern Uttar Pradesh, among those who congratulated her publicly was her husband of 22 years. "Congratulations P... always by your side in every phase of your life. Give it your best," Mr Vadra wrote on Facebook, within moments of the Congress officially announcing Priyanka Gandhi Vadra's appointment. Priyanka Gandhi Vadra's display of support for her husband also coincided with her formally taking charge of her post. Mr Vadra was directed by a Delhi court to cooperate with the investigation being carried out by the central probe agency after he knocked on its door seeking anticipatory bail in this case. The court had asked him to appear before the Enforcement Directorate on Wednesday after returning from London. The case relates to allegations of money laundering in the purchase of a London-based property - located at 12, Bryanston Square - worth 1.9 million pounds, which is allegedly owned by Mr Vadra.